Don’t worry… I can still plant potatoes there and grow more chard somewhere else. I have to rotate my crops anyway. 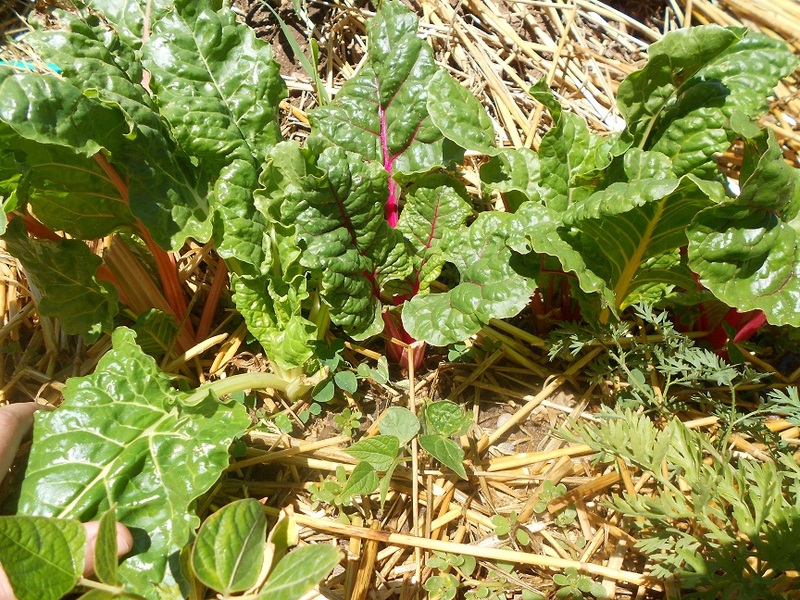 It’s not like chard is difficult to grow. Also known as silverbeet, white beet, leaf beet, and Roman kale (among other names,) Swiss chard is indeed in the beet family. 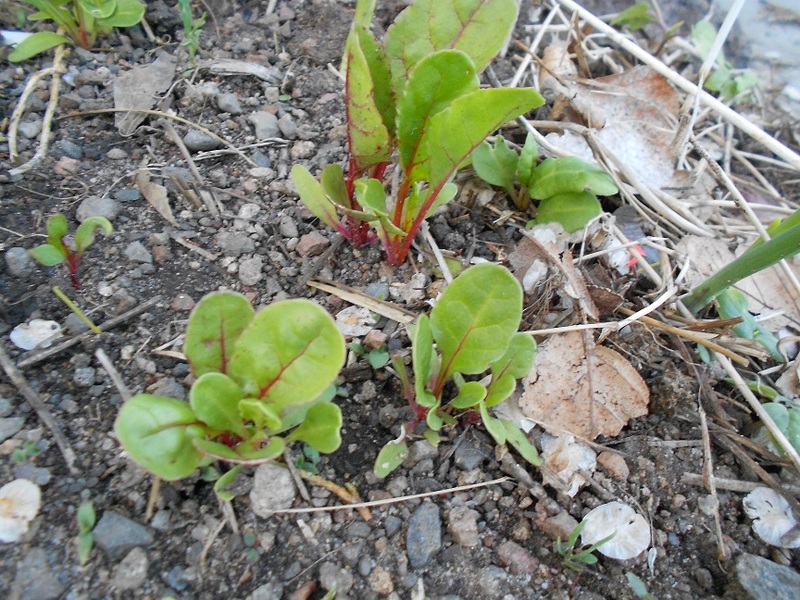 Unlike beets, chard is only grown for its leaves and stems. Though the leaves are tougher than spinach, they’re not as tough as kale. It tastes like a tangy, slightly sour spinach, and it pairs well with yogurts, lemon juice, goat cheese, and vinegar. 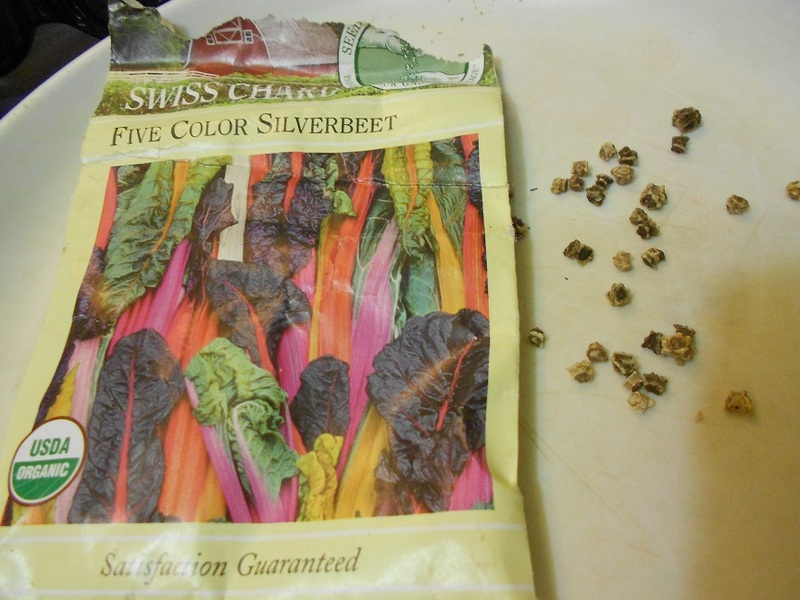 Why should you grow Swiss chard? -It’s a “cut and come again” crop, meaning you can harvest from the same plant again and again. 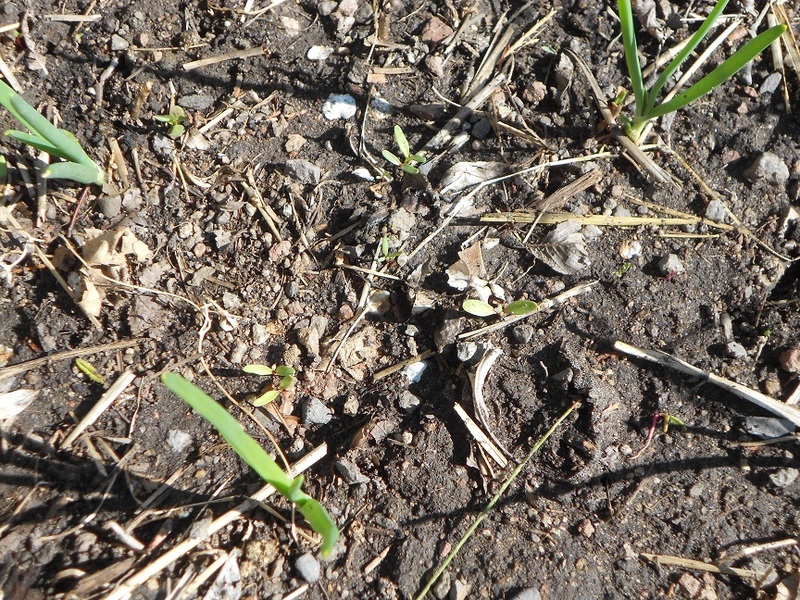 The soil needs to be 50 degrees for seeds to germinate, though it does not need to be past your last frost date. You can either wait until the soil is regularly 50 degrees, or you can start seeds inside then transplant outside. Some gardeners suggest soaking the seeds overnight in water. I have never done this, and have had fabulous luck with seed germination. Choose an area in full sun, though chard will tolerate some shade. Sow the seeds about ½ inch deep, a few inches apart. The seeds are large and easy to see, so spacing is not difficult. When the seeds sprout, you will see multiple stems come up. It may look like you planted two seeds in the same spot, but if all stems are the same color, they all belong to the same plant. Thin the seedlings to about 6 inches apart, for best harvest results. Keep the soil damp but not wet. 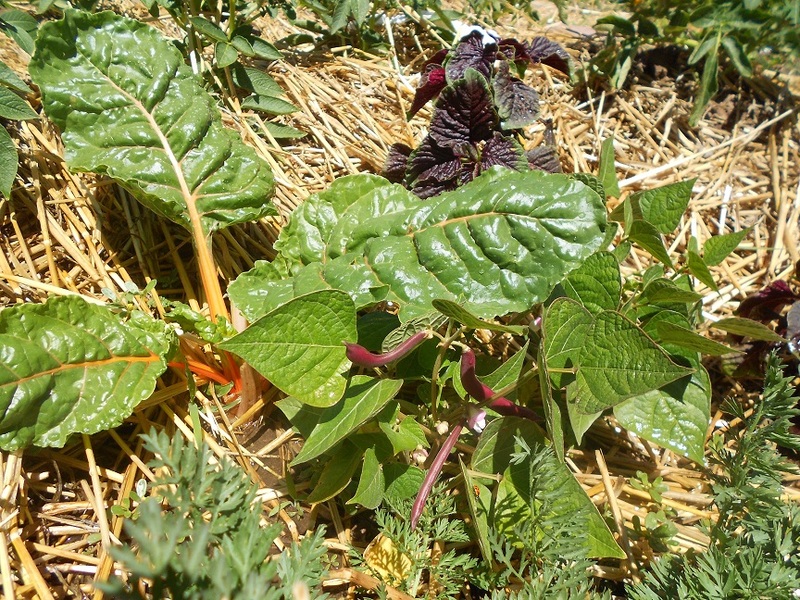 Mulch plants with compost or grass clippings to keep away weeds. Chard at 1-2 inches tall. Yes, I need to thin this. In the fall, your chard will withstand moderate frosts, though the cold temperatures will toughen the leaves and might even bring out some rosy color. If you protect the chard with some plastic, you might be able to extend your crop past Thanksgiving. 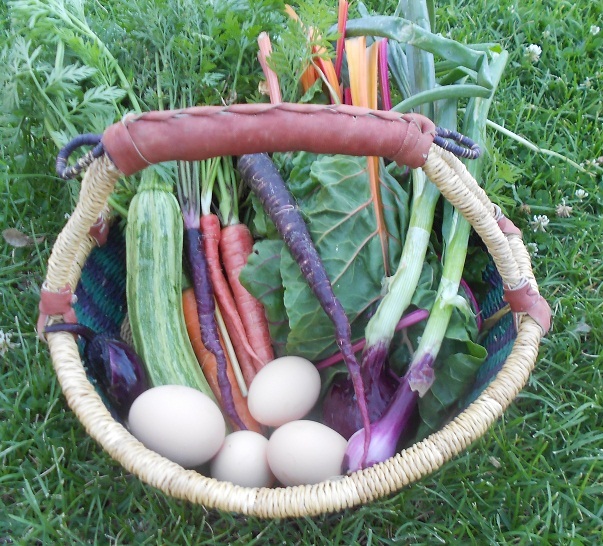 Chard… and carrots, onions, zucchini, eggs… a tasty dinner. When the plant is 6 inches tall, you can start harvesting leaves. Just cut the leaves and stems off with scissors or a sharp knife, about an inch above the soil. You can either cut the entire plant back, or you can trim off the outermost leaves and leave 2-3 of the tiniest leaves to regrow. The beauty of chard? Either way, it will grow back. I like to remove just the outer leaves, because those little inner leaves catch the sunlight to photosynthesize, allowing quicker recovery for the plant. The stems are tougher than the leaves, so be sure to cook them longer. Otherwise, you’ll have tough, chewy, and stringy stems in your food. Chop them into small pieces, all the way a little past the bottom edge of the leaf. The stems take about as much time to cook as pieces of chopped onion do, so if you’re also cooking with onion, you can add these at the same time. Add the leaves to the dish at the very end, with less than 5 minutes left to go in the recipe. -Saute in butter and drizzle with a little balsamic dressing. Sprinkle with crumbled chevre. -Chop and add to broth-based soups. Be sure to add the stems first and let cook a little before adding the leaves. -Use the sautéed stems with rice, mushrooms, onions, almonds, and chopped basil, as a filling for stuffed bell peppers. -Roll raw leaves up in inside sheets of puff pastry, with some ham, a mild white cheese, and diced shallots. -Make a tangy quiche. Saute up the stems with other vegetables, adding the leaves during the last few minutes. Replace some of the milk or cream with plain yogurt. Use a mild white cheese so the flavor does not compete with the tanginess. -Chop the stems and sauté them with onions. Then slice the leaves into thin ribbons. Sprinkle both of these on a pizza before baking. The leaves crisp up in the most delightful way! 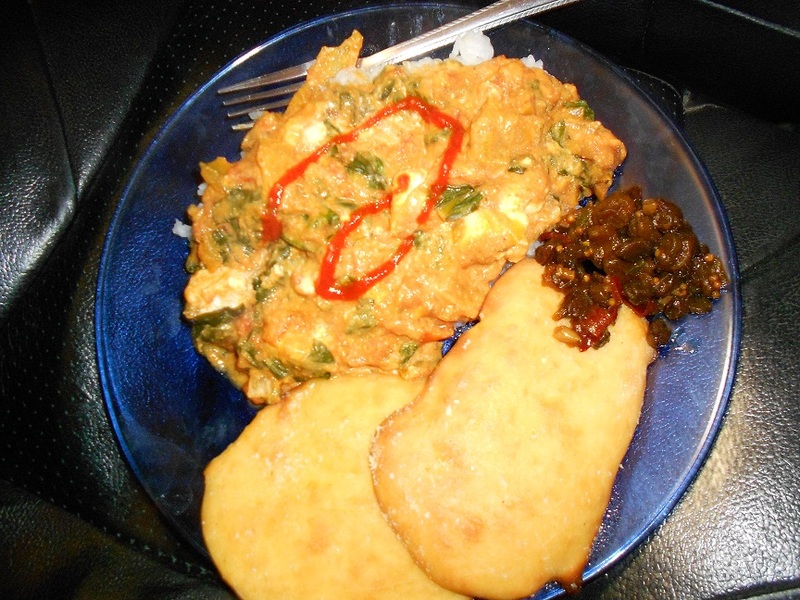 -Substitute for spinach in any recipe that complements the added tanginess. Indian food is especially good for this, because the yogurt, lemon juice, and/or ginger all pair very well with chard. In fact, I’ve included my favorite way to cook chard at the bottom of this post! Do not home-can chard unless you use a pressure cooker. This is a very alkaline food, and will lower the acidity in a recipe to unsafe levels for waterbath preserving. If you do home-can your chard, be sure to use a recipe approved by a major canning label. Freezing chard is easy, though a little blanching is required. I like to chop the stems first, and sauté them with onions, then bag them up separately. I’ll pull these out of the freezer for soups, pizzas, quiches, etc. To blanche the leaves, get a pot of water boiling. Immerse the chard completely into the water, and allow it to boil for two minutes. Remove the chard from the water with a spaghetti server and dunk immediately in ice water. Don’t worry about ruining the leaves. They can handle it. Let the chard stay in the ice water until it is completely cooled. Drain the chard in a colander until most of the water is off then pack in a freezer bag, pressing out all of the air. Chard can stay good in a freezer for up to a year if blanched first. Palak Paneer is creamy spinach with paneer (Indian homemade cheese). This is a very popular with youngsters and served in every Indian resturant. The creamy texture of spinach with paneer is a very good combination. If using frozen spinach thaw and blend it just for a minute so spinach has a creamy texture but without becoming pasty. blend the tomatoes and ginger to make puree. Mix coriander, turmeric, and red chili with tomato puree and set aside. Mix whole-wheat flour with heavy cream and set aside. Heat the oil in a saucepan. Test the heat by adding one cumin seed to the oil; if it cracks right away it is ready. Add paneer and fold it gently with spinach and let it simmer for a 2-3 minutes. Pot should remain covered until the cooking is finished, otherwise the spinach will splatter. Makes me want to start a garden and grow chard! I love it! Wonder how it would do in FL? I’m sure it would do great! It puts up with the dry air and lack of water here, but it seems to grow best when it’s hot and rainy.